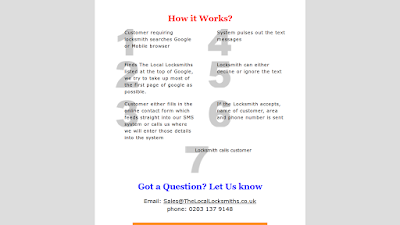 TheLocalLocksmiths essentially are building a nationwide locksmith database and providing the locksmith with sms texts when a customer finds the site (TheLocalLocksmiths) and calls into to our call centre. 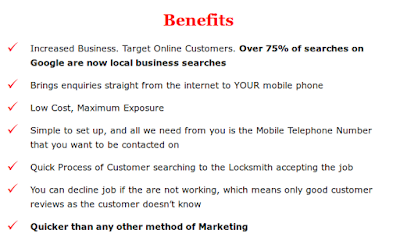 If you visit the site, you will see the list of benefits. 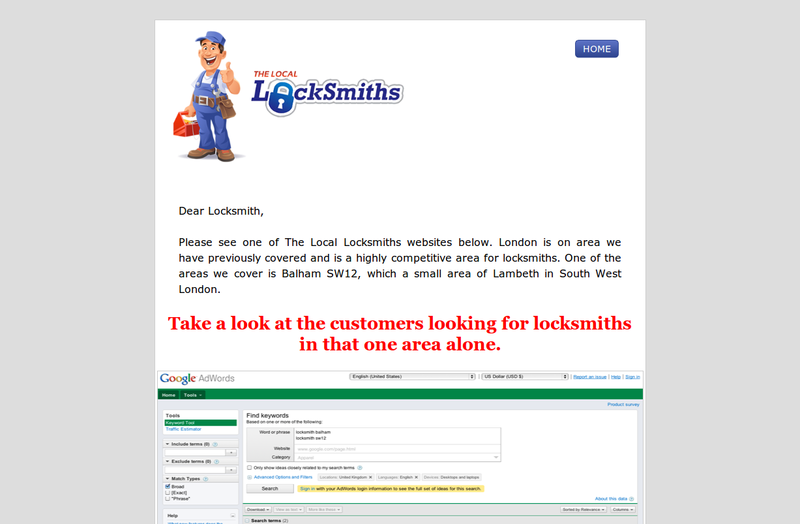 I am assuming that your site offers a locksmith locating service, am I right? I was "assuming" because your website copy wasn't clear about it. 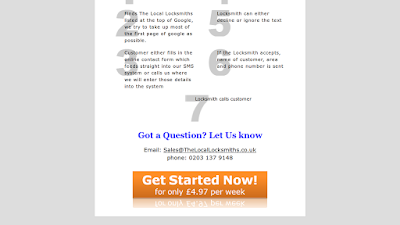 Your website copy somehow gave me an idea that it's about local locksmiths, but the grammar is confusing. As I mentioned in my previous blog posts, your audience's average attention span is five seconds. When you fail to motivate your audience to spend more time on your site, they'll go to someone else's site instead. All my analysis will only focus above the fold. 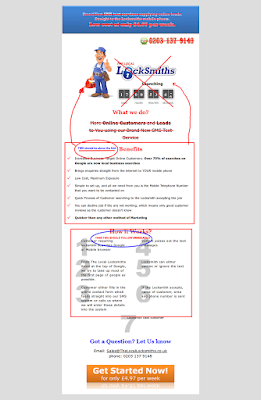 This is that part of your website that we see in the first five seconds. When your copy fails to motivate us to spend more time on your site, everything else is useless. 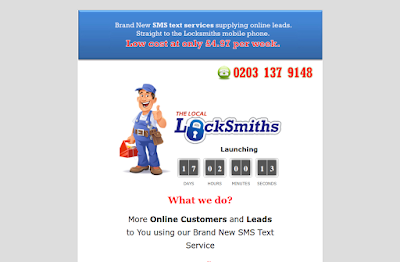 Brand new sms text services supplying online leads. 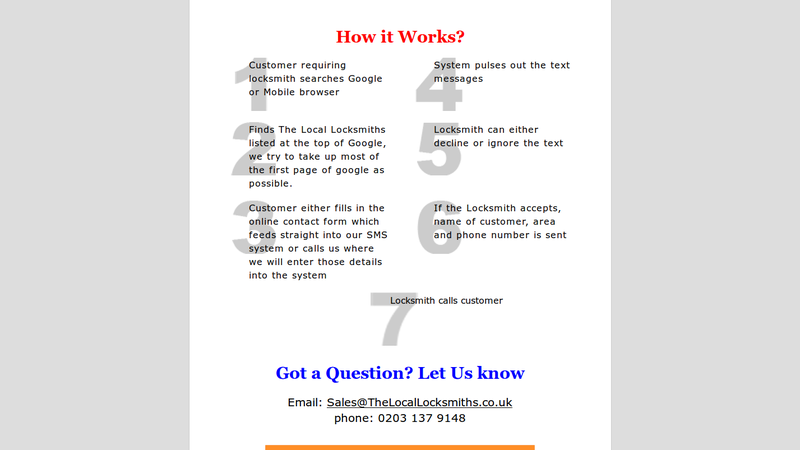 Straight to the locksmiths mobile phone. Low cost at only $4.97 per week. Believe me, that did not make any sense. 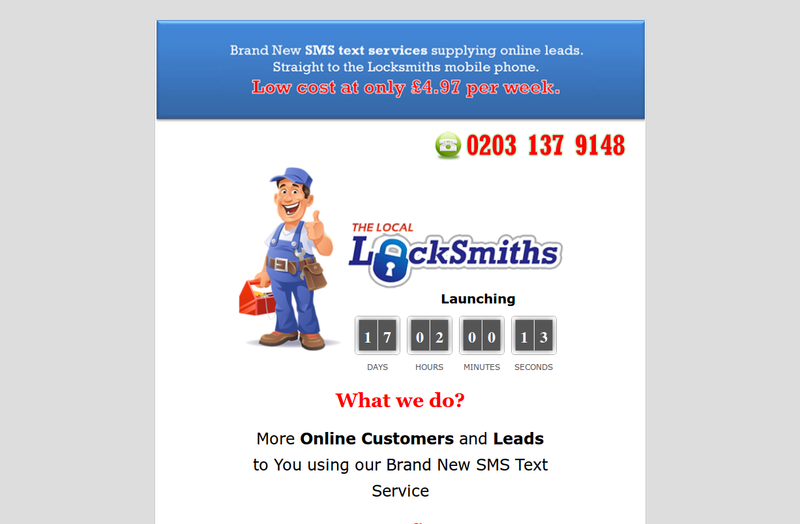 What I understood is that you have a new sms text service and that it costs five bucks a week. What it is for and how it will benefit me, as your target audience is not clear. The countdown widget right smack in the middle of your site is of no use. Your target audience doesn't care when it's going to launch. 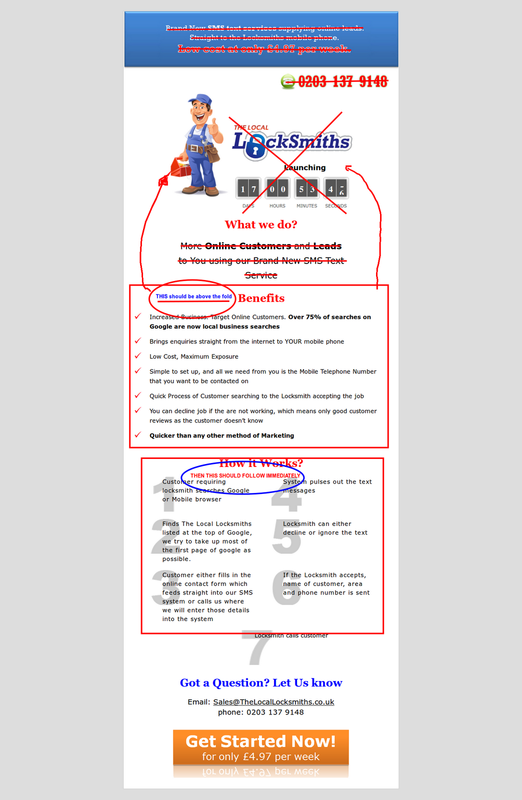 What they want to know is what benefit can they get from your website? What is the number one benefit that you offer to your audience? To find locksmiths within a particular locale, isn't it? Looking at the site, everything above the fold only talks about yourself, who you are and what you do. Imagine yourself at a cocktail party and you find yourself with someone who only talks about themselves, who they are and what they do. Isn't that a bore? Wouldn't you want to go talk to someone else instead? The benefits copy (image below) should have been above the fold. This is what your audience should see when they see your site. In a glance, it tells them everything they wanted to know about your site. Your audience finds your site. 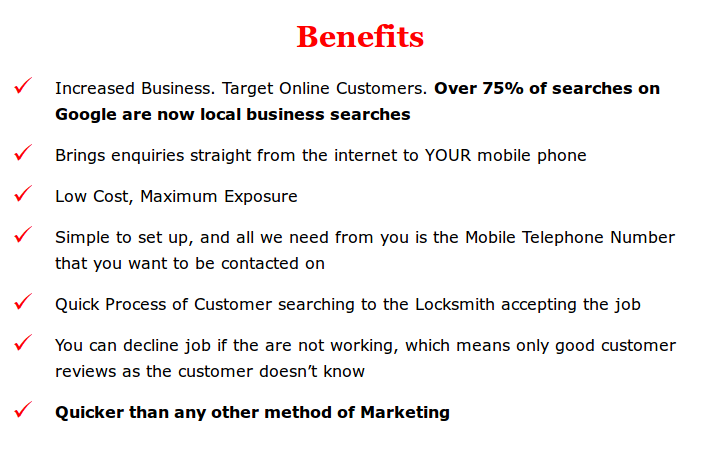 First five seconds when they see these benefits, they will think, "Aha, this is what I am looking for. I wonder what else they have for me...?" 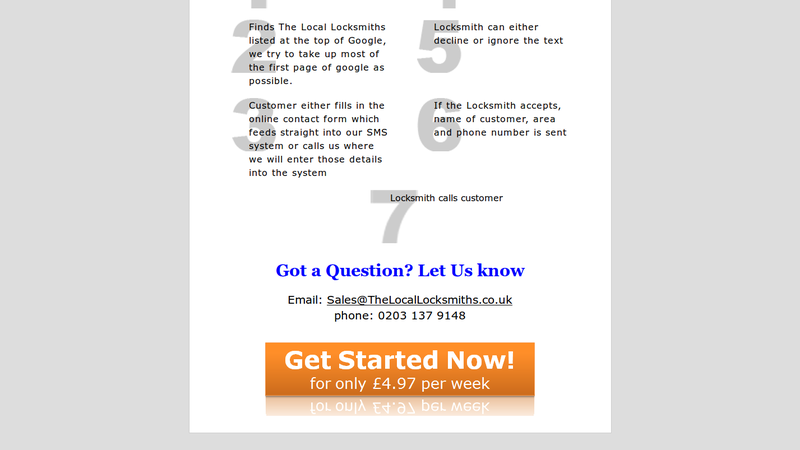 You then show proof elements about the service that you offer. Give them testimonials... show them how-to videos... show them statistics... give them case studies. Whenever your audience hits Page Down, they are motivated. That 5-second timer has been reset and you get another chance to keep them on your site. They want to learn more. They are looking for proof that your claims are true. They want evidence that you can deliver on your promises. Give them that. Hitting page down, the "How it works" copy should come next. Again, your most important message should go above the fold. The first 5-seconds that people find your site, give them everything you've got--"HERE IS WHAT YOU WANT." Everything else that will support your claim should follow immediately after that--"HERE'S WHY... HERE'S HOW." After they are satisfied and find you credible, only then can you give them your contact information. I clicked on the Get Started Now button, and I get a 404 website not found. You are fixing this, right? You also gave me the URL to this other page. I did not find this on the home site navigation, so I will assume that this is an alternate landing page. It wasn't clear what this page is about. Again, first 5-seconds, make it evident to your audience what the page is about. The moment your target audience finds this site, the 5-second timer starts ticking. The grammar is all wrong. The words doesn't make sense. It doesn't connect. When the grammar doesn't make sense, they are not going to try to figure out what you are saying. Some of them might scroll down, and see the illustrations. But if your words fail to connect, these illustrations will not help much. Tell me, what's the path of least resistance for them at this point?